부여 능산리산의 남쪽 경사면에 자리잡고 있는 백제 무덤들이다. 무덤은 앞뒤 2줄로 3기씩 있고, 뒤쪽 제일 높은 곳에 1기가 더 있어 모두 7기로 이루어져 있다. 오래 전부터 왕릉으로 알려져 왔던 곳으로 일제시대에 1∼6호 무덤까지 조사되어 내부구조가 자세히 밝혀졌고, 7호 무덤은 1971년 보수공사 때 발견되었다. 고분의 겉모습은 모두 원형봉토분이고, 내부는 널길이 붙은 굴식돌방무덤(횡혈식 석실분)으로 뚜껑돌 아래는 모두 지하에 만들었다. 내부구조와 재료에 따라 크게 3가지로 나눌 수 있다. 먼저, 1호 무덤(동하총)은 네모형의 널방과 널길로 이루어진 단실무덤으로 널길은 비교적 길고 밖으로 갈수록 넓어지는 나팔형이다. 널방의 네 벽과 천장에는 각각 사신도와 연꽃무늬, 그리고 구름무늬의 벽화가 그려져 있는데, 고구려 고분벽화의 영향으로 보인다. 2호 무덤(중하총)은 무령왕릉과 같이 천장이 터널식으로 되어 있으며, 가장 먼저 만들어진 것으로 보인다. 3호 무덤(서하총)·4호 무덤(서상총)은 천장을 반쯤 뉘어 비스듬히 만든 후 판석을 덮은 평사천장이고 짧은 널길을 가졌다. 이 형식은 부여지방에 많으며 최후까지 유행한 것으로 보인다. 능산리 무덤들은 일찍이 도굴되어 두개골 파편·도칠목관편·금동투조식금구·금동화형좌금구 등 약간의 유물만 수습되었다. 무덤들 서쪽에서는 절터가 발굴되어 백제금동대향로(국보 제287호)와 백제창왕명석조사리감(국보 제288)이 출토되었는데, 이로 인해서 능산리 무덤들이 왕실 무덤지역라는 것을 재확인시켜 주었다. 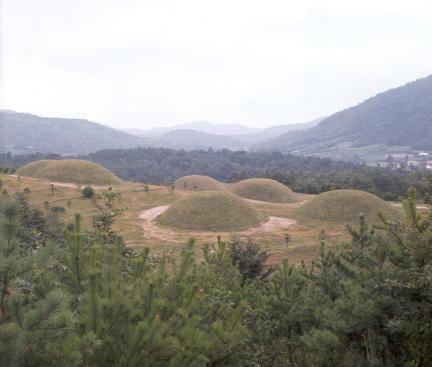 The ancient tombs of Baekje are located on the mid-slope of Neungsallisan Mountain. Based on the theory of feng shui, three of them are situated at the front, and another three, in the middle, with the last one located at the back, the highest position. Known as royal tombs since long ago, six tombs (Nos. 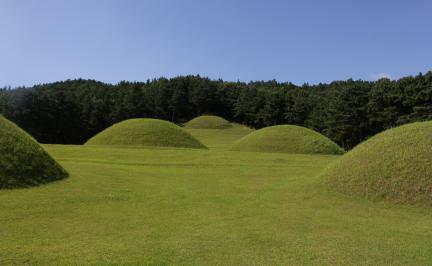 1-6) were excavated during the Japanese colonial rule; the seventh was discovered in 1971 during a repair work. 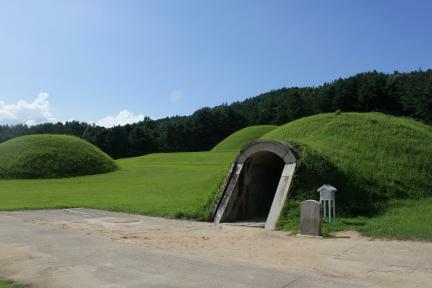 Their mounds are round and are categorized to be of the stone chamber tomb with tunnel entrance type. The tombs are divided into three categories according to the structure and material used for construction. With the tunnel-type ceiling of the chamber, Tomb 2 is regarded as the earliest. 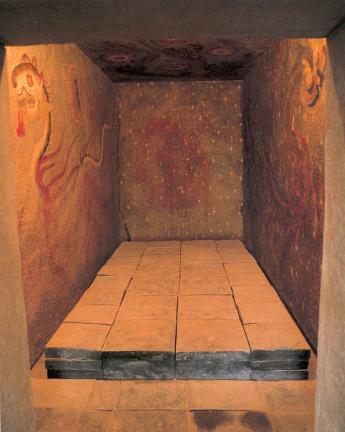 On the other hand, Tomb 1 has a ceiling made of a single stone plate, just like the typical Goguryeo stone chamber tomb. The gods of death are painted on all four walls, and lotus and cloud patterns, on the ceiling. Tombs 3 and 4 have slanted ceilings made of stone plates, with the passage to the chamber shorter than the others. Found mostly in the Buyeo area, this is the latest type. 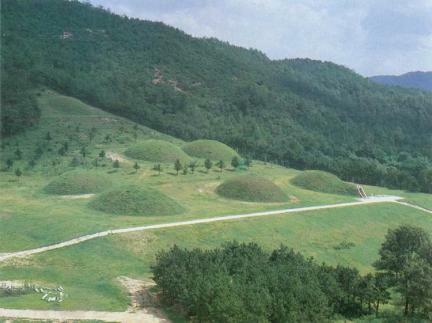 Not many relics were found in the Ancient Tomb in Neungsan-ri because they had already been burgled. 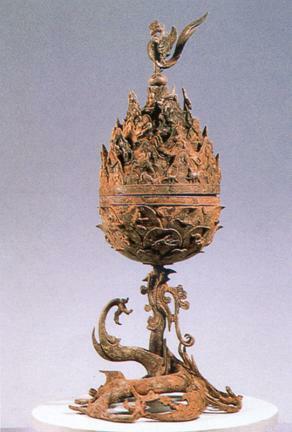 Recently, however, a temple site was found west of the tombs where archaeologists excavated a gilt-bronze incense burner and a royal sarira reliquary - evidence that these are royal tombs. The structure of these tombs consists of a main chamber and a passageway, but the shape of the roofs and walls in each are slightly different. 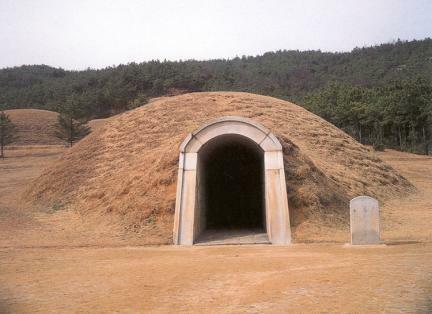 One tomb located at the center of the front row has a chamber structure composed of long stone slabs quite similar to that of the brick-constructed tomb of King Muryeong in Songsan-ri, Gongju. Another stone chamber tomb composed of well-trimmed stone slabs located east of the front row is famous for the wall paintings shown dimly on the surface of four walls and ceiling. These wall paintings, painted on the surface of the four walls, portray the Four Spirits: Blue Dragon (east), White Tiger (west), Black Tortoise (north), and Vermilion Phoenix (south). Lotus design and images of flying clouds adorn the ceiling.